Letter No. 977/SY/PBCC/LHR is issued by Punjab Boards Committee of Chairmen dated 14-12-2017 Extension in Admission Date for SSC Exam Board 2018 for All Board of Intermediate and Secondary Education in Punjab. 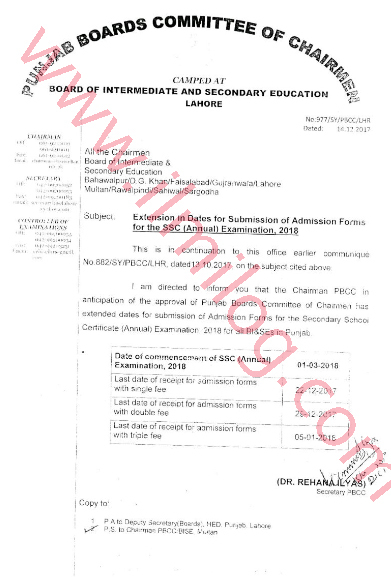 Board of Intermediate and secondary education Lahore d other boards have decided to extend the admission date of SSC exam 2018. All the Chairmen Board of Intermediate and Secondary Education in Punjab. Subject: Extension in Admission Date for Submission of forms SSC Exam 2018. This is the continuation of this office dated 13-10-2017 on the subject cited above. It is directed to inform that the chairman PBCC in anticipation of the approval of Punjab boards committee of chairmen extended Admission Date for Submission of forms SSC Exam 2018 for All Board of Intermediate and Secondary Education in Punjab.